Krauss’s elegant, provocative, and mesmerizing novel is her best yet…Vivid, intelligent, and often humorous...A fascinating tour de force. Brilliant… a dazzling and fascinating meditation on fiction itself…entirely original… Forest Dark finds Krauss at the top of her game. It is blazingly intelligent, elegantly written and a remarkable achievement. Lucid and exhilarating…Elias Canetti once wrote of Kafka that he sought, above all, to preserve his freedom to fail. In this spirit, Krauss, an incisive and creative interpreter of Kafka, allows Nicole and Epstein to regain their own freedom to fail. This particular freedom should never be taken lightly. It’s a great gift not only to her characters, but to her readers. Magnificent… Forest Dark is a richly layered masterpiece; creative, profound, insightful, deeply serious, effortlessly elegant, both human and humane. Krauss is a poet and a philosopher, and this latest work does what only the very best fiction can do — startles, challenges and enlightens the reader, while showing the familiar world anew…To get lost in Forest Dark is to wonder. It is a pleasure and a privilege to read. Writes insight and revelation better than just about anyone working today…While Krauss’s genius has long been evident, of her four books this one cuts closest to the bone. The woods may be dark, but Krauss’s gorgeous sentences light our way through. Delving into the metaphysical and the spiritual realms, Krauss presents a stirring, sprawling exploration of the “unformed and nameless life” that exists alongside the one we’re consciously living. A triumphant new novel…that suggests a determination to stretch conventional narrative in unconventional directions…Krauss’ prose balances precision and grace…This author is incapable of writing a sentence that does not seem chiseled to perfection…In Forest Dark, Nicole Krauss has once again mastered a light touch in pursuit of weighty themes. Call it a meditation in identity--personal, national, theological, tribal--that poses thorny questions about the mire that is the modern human condition. Call it an existential mystery about the enigma that is yourself and your fragile place in the world...This is as original and impressive a work of fiction as I have encountered in years; a welcome novel of how a novel can be defiantly and brilliantly novel. Wildly imaginative, darkly humorous and deeply personal, this novel seems to question the very nature of time and space. Krauss commands our attention, and serious readers will applaud. Krauss expertly intertwines musings on theology and the life of Franz Kafka in this beautifully written follow-up to the National Book Award finalist The Great House. The pleasure of Krauss' writing...[is] the wayward precision of her language that draws us into the desert, "the forest dark" and other contemplative places where illumination occurs. Strange and beguiling…a mystery that operates on grounds simultaneously literary and existential…metaphysical and emphatically realistic…It’s a perfectly Kafkaesque vision, almost uncanny enough to be sublime. One of the bravest and most original writers of her generation… Forest Dark—the best new novel I’ve read this year…Krauss’ intrepid journey into this forest reveals great secrets, involving the tales we tell as we whistle in the dark. Forest Dark is Ms. Krauss’s attempt to release herself from the conventions of form and rationality—to swim ‘against the forceful current of understanding.’ It adapts the themes and the narrative tricks of The Counterlife, imagining alternate realities while occupying the shadow space between autobiography and fiction… One of the steep pleasures of Forest Dark is how unabashedly bookish it is…. Only a handful of books that come out each year immediately signal “masterpiece.” Nicole Krauss’ Forest Dark, a brilliant effort that defines the human condition in an original way, is one of them. It is transformational... astonishing...While the storylines of Epstein and Nicole never quite touch, they reflect and illuminate each other in dozens of ways…and generate an outcome that is far more than the sum of its parts. This structural inventiveness, coupled with the author’s soaring imagination, probing intelligence, and exquisite style, screams masterpiece. Forest Dark is epic, though in its own way: quiet, eerie, touchingly inchoate. It is an epic of loneliness, a testimony of and to longing that remains unfulfilled…Krauss has always been a writer interested in the hidden, spiritual dimension of things, and her work concerns itself with the mystical, the metaphysical, the mysterious… Forest Dark is beautiful and complex but subtle and so closer to truth…It is elegant and shimmering, a slant of light shining long enough to make us wonder. 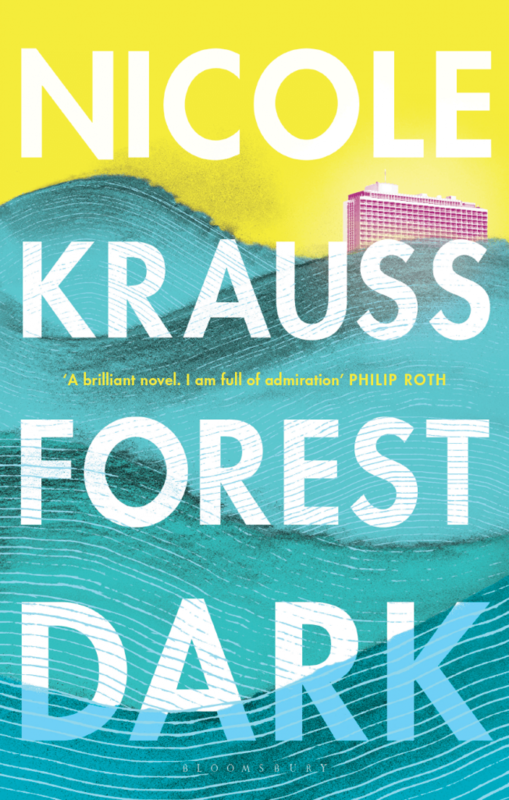 Nicole Krauss remains accessible through all of the risks she takes, which might be her greatest feat…Forest Dark expands the possibilities of what the novel is capable of...The novel is a whirlwind, pure and simple. It might not tie up every loose end, but its force is undeniable. Forest Dark had me from the start… This is very much a Krauss novel. Her voice and distinctive intellectual detours cause sparks that are hers alone. Her favouring of reflection over plot leads us to a hushed realm in which, perhaps inevitably, the essayistic passages are ultimately more compelling than the story. Story tends toward the erosion of mystery. Krauss is at her best when poised along mystery's perimeter…Is there a finer method of escape than to write? Or to read? The writing Krauss engages in deliberately straddles the frontiers of resonant fiction and recognizable self. It offers a vast space in which one can lose oneself, but it also supplies some level of closure to bring us back. Entrancing and mysterious…Krauss reflects with singing emotion and sagacity on Jewish history; war; the ancient, plundered forests of the Middle East; and the paradoxes of being. A resounding look at the enigmas of the self and the persistence of the past. Like Krauss’ previous books Great House and The History of Love, Forest Dark slowly builds to a powerful emo­tional crescendo and an ending that feels revelatory. Haunting and reflective, poetic and wise, this is another masterful work from one of America’s best writers. The tangled necessity of such double-ness is one of Krauss’ core themes and the key to her characters’ quests: how we are at once shaped and confined by the forms we require for life, be they stories, relationships, or places. A literary adventure in a different kind of storytelling…Krauss’ voice in fiction is still original: She crafts beautiful sentences, challenges form and ideas, creates characters alive to possibility and she’s funny. The feelings Epstein and Nicole have about their lives and loves feel hard-earned and true…The resonances between these characters are often profound. Both are searching for their true selves, an ocean away from the old lives that have tested their faith. Slowly, surely, Krauss pulls you into her world, her supple writing wearing those big themes lightly … a deft and mesmerising portrait of female midlife crisis … Suffused with longing and wearing its intellect lightly but purposefully, Forest Dark is … all but impossible to put down. Extraordinarily evocative … Nicole Krauss is always in control of the flow of ideas and allusions even as she evokes her two protagonists' increasingly feeble control over their own minds and sense of themselves. It is a remarkable accomplishment. Brilliantly strange and utterly compelling. Nicole Krauss confirms her reputation as one of the great living American writers in this bravura novel. Astonishing...Psychology, theology, history, metaphysics, and Kafka collide in this beautiful, inventive and intellectual work that deserves literary-prize recognition.